Personal attention and genuine care are the most important services that we at Loudon Park Cemetery can provide. Our goal is to help families celebrate and honor the life of a loved one. With all funeral and cemetery arrangements in one beautiful location, this impressive combination of services means convenience and savings for the families we serve. And, the Loudon Bell, which was cast in 1898, continues to toll as a tribute to Loudon Park families who choose both the funeral home and the cemetery. Loudon Park is Baltimore’s largest cemetery, encompassing nearly 500 acres and 26 miles of paved roads. Since 1853, the beauty and serene atmosphere of Loudon Park Cemetery have provided peace and comfort to area families. History is reflected throughout the park, with its simple headstones, mournful statues and stately monuments adorned with handcrafted figures and funerary urns. Also of note is the Weiskittel mausoleum—constructed of cast iron and painted silver—which is listed on the National Register of Historic Places. The mausoleum is the final resting place of the Weiskittel family, who were manufacturers of cast-iron stoves. The luxurious park-like grounds are meticulously cared for and offer picturesque views, along with a variety of interment options. Two veterans gardens, Garden of Military Honor and Valor Hill, serve as lasting memorials for those who fought for their country. Maiden Choice Run is another highlight of the cemetery. 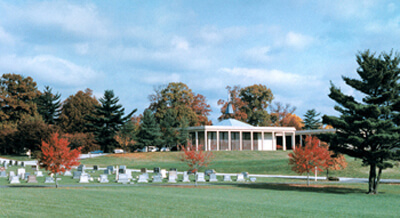 It is a beautiful contemporary area featuring community mausoleums, crematory and columbarium, and garden crypts. Loudon Park has been designed for expansion far into the future and will continue to combine over 150 years of service with the latest concepts in burial.